We spent this long weekend in the Florida Keys, primarily in Islamorda. 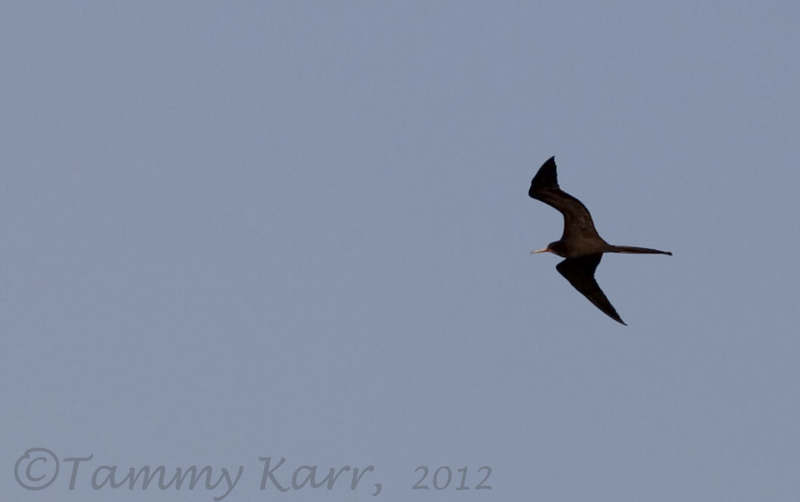 I was able to see one bird I was really hoping to see, the Magnificent Frigatebird. I had read that these were resident birds of the area, so I had been watching for them. I actually saw three of them, all of which were inflight. They were still quite a sight! 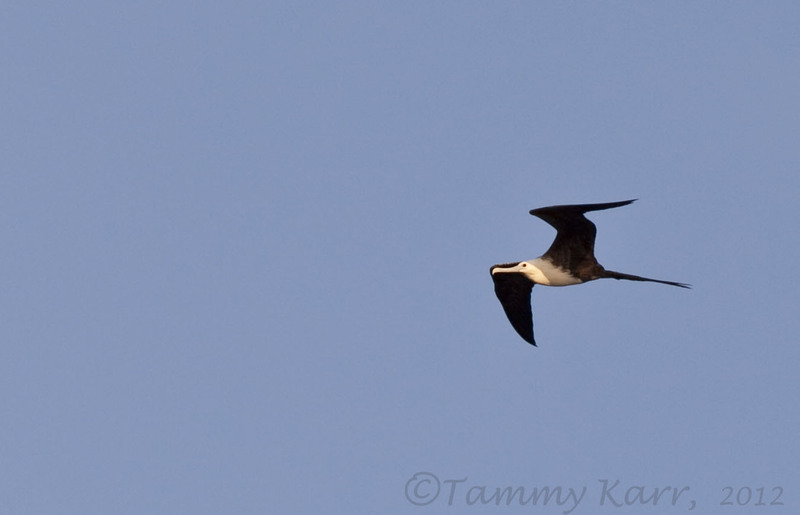 I was photographing some other birds on the north side of the Tea Table Key bridge when I noticed two Frigatebirds were patrolling the area from the sky. I believe one was an adult male and one was a juvenile. The pictures are from quite a distance (with a 300 mm & 1.4x), cropped for a closer view. From what I've read, the juvenile continues to be be fed by the female for up to one year. The male usually abandons the female and juvenile by the time the juvi is half grown. These two were definitely sticking together, making very wide aerial circles of the area. The next evening I came back to the same bridge in hopes of seeing the Frigatebirds again. This time, however, I only saw one, which I believe was an adult female. The bird made one pass, but this time actually went right over my head. I was of course frantically attempting to get some photos. Awesome, the Frigate Bird is one I'd love to take a photo of. Your photography is beautiful. 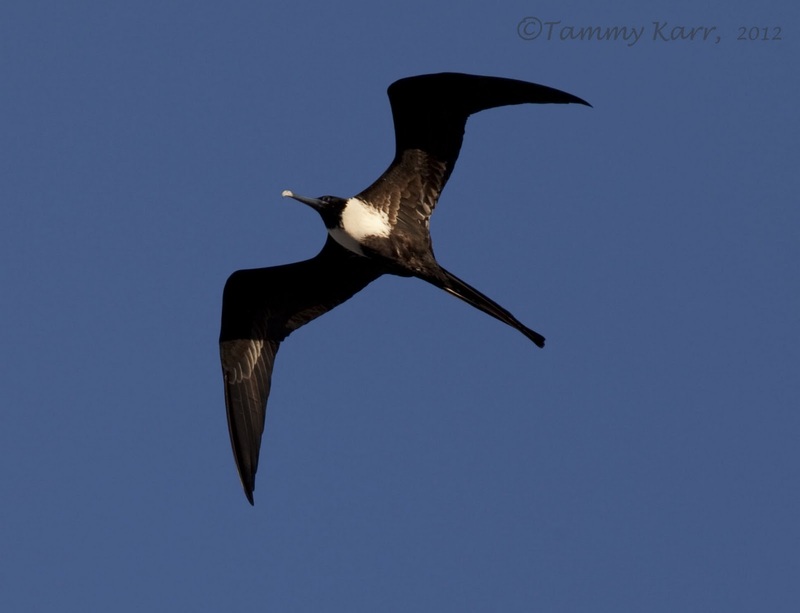 Frigatebirds are some of my favorite birds (I have a tattoo of one). It's impossible to get tired of watching them. I didn't know juveniles got fed for so long, thanks for dropping some good knowledge! I was really excited to see them! Maybe next time I can see them alittle closer. What a bird. How I would love to see one of these. You done well with the camera, cracking shots. I love the silhouette of the Frigate Birds. It should be lots of fun to return there and see some males with their throat pouches too. Looking forward to those photos! I would love to see that (and get a picture)!!! ¡Que ave mas curiosa! parece prehistórica. Wow, what a stunnig bird, i would like to se one some day. Thanks for showing beautiful picture of it. Thank you Ingemar! I hope you see one too! Tammy, Exceptional images of a bird that is often difficult to photograph! I have seen them on the west coast of Florida, so high in the sky that they barely show up in the photo. 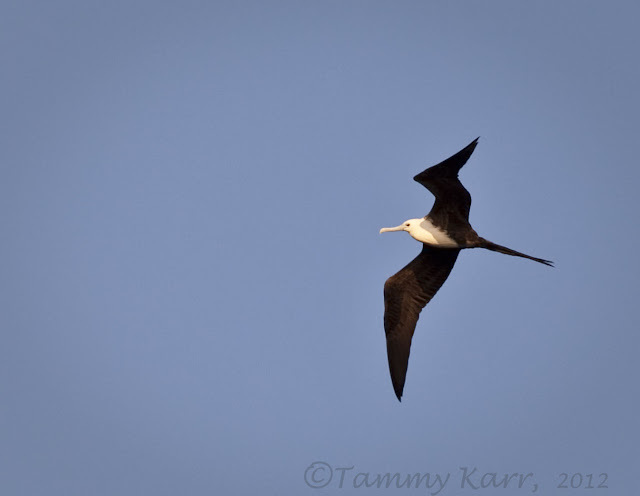 I find the wing shape on Frigatebirds so very beautiful. A pleasure to visit your wonderful blog! Thank you Julie! Thanks for visiting! Lucky you! This birds is on my "want" list!